This cozy house is immaculate, updated and comfortable. It is light and on the sunny side of the lake. The house sits about 200 feet off the lake, large private sandy beach with private dock and a beautiful view down the lake. Recently remodeled, with all hardwood floors, new bathroom, granite counters, new kitchen cabinets, extremely clean and cozy. It has boat launch facilities close by (within 3 miles). There are two resorts with restaurants close by also. Silverwood Theme Park and Triple Play fun center are located within 30 minutes to 1 hour away. Coeur d'Alene offers many different activities including spas, antiquing, boating, parasailing, any and all outdoor activities, jet ski rentals, skiing, etc. The house has a fire pit on the private beach with seating around fire. There is a swimming area that is very clean and safe from boaters. This is a family paradise and a very safe area for children of all ages. We allow animals, large dogs must remain outside and smaller dogs are welcome inside providing they are housebroken. The house will easily sleep eight people in all new beds, sofa beds and linens with down alternative comforters and pillows for extra comfort. Everything in the house is new and of good quality. Anyone renting will hopefully find everything they need in an extremely comfortable and fun environment. Please give us a try. You won't be disappointed. My husband Henry and I bought this adorable home in Driftwood Bay on Lake Coeur d'Alene in North Idaho about 10 years ago. Our family summer/lake home is right next door and we jumped on the opportunity to purchase the house next door to rent out. We have met the most wonderful people who have rented from us. We love our guests and have many that come back year after year. My husband Henry and I bought this adorable home in Driftwood Bay on Lake Coeur d'Alene in North Idaho about 10 years ago. Our family summer/lake home is right next door and we jumped on the opportunity to purchase the house next door to rent out. We have met the most wonderful people who have rented from us. Many Canadian's and more recently locals who are choosing to stay closer to home to eliminate the airfares involved with traveling further away. The house is so cute and extremely clean. It really is 'right' on the beach. Home was recently remodeled with new kitchen cabinets with granite counter tops, wood floors throughout, bathroom completely updated with new tile, sink, toilet and tub surround. Our home sleeps 8 comfortably. When you go out onto the front deck there are steps that lead to a grassy area and then right down onto the sand. There is a large tree right there for shade and lazy summer naps on the lounge chairs, but sun and water are also steps away. Brand new dock with protected boat slip, swim ladders, lighting for night activities. The dock accommodates patio furniture on the large deck area at end of dock. Night campfires are great in the fire pit on the beach. The neighbors all down the beach have campfires so you can hear the music and laughter from them as well. It really is a great place to vacation, you are in your own world or visit the resorts and restaurants within a short distance away if you prefer. I know you will not be disappointed. If you want to travel into town it is about 20-25 minutes away, or you can go by boat if you have one. There are unlimited activities in Coeur d'Alene. Antiquing, hiking, renting jet skis, airplane rides, a beautiful resort to enjoy, wonderful shopping and fabulous restaurants to choose from. You can also go east to the 'Silver Valley' and enjoy a gondola ride in Kellogg, or again antiquing or hiking or tour a real silver mine. Another fun activity is to visit Silverwood Theme Park with a huge Water Park included. It is North Idaho's version of Disneyland. It is fun for the whole family and only about 45 minutes from our lake house. Bring your own equipment wonderful ski resorts within 45 minutes! Super little cabin with fun sandy beach had everything we needed! Really enjoyed this little cabin on Driftwood Bay. The cabin was small but had everything we needed. They did a good job of using just about every available storage spot and it was really very well equipped. We also had plenty of supplies and backups as needed. The upgrades to the floor and kitchen counter top are very nice. It would be wonderful if screens could be added in the front windows so we could let in the lake breeze without the letting in the bugs. There are screens on one bedroom window and the kitchen window so those were appreciated! The owner and her family were terrific to work with, helpful and friendly but also let us have our own family space. Neighbors on the other side were also very friendly and shared lots of things with us. For boat owners, this bay does tend to get a lot of wind and waves. The name Driftwood is fitting (we had a log come in while we were there). The regulars all have boat lifts to prevent the wave action from beating up their boats. We tried tying ours to the dock but it would not work for several of our most windy days. The dock is nice though with two ladders. There are plenty of deck / beach chairs that were wonderful for sitting out on the nice sandy beach and enjoying the sun during the day and at night the glorious stars! This was a great place for our family of four to call home while we explored the lake. 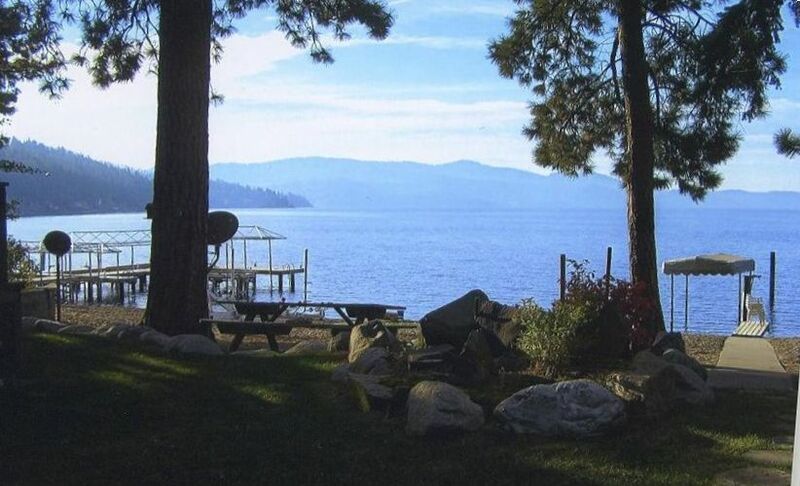 This home is about 650 square feet and truly has an amazing view and beach - one of the best I've seen on Coeur d'Alene. It is advertised as being able to sleep 8 "easily" - personally I feel it would be tight with any more than a family of four or five trying to stay there. Clean and comfortable. The only things missing are an outdoor table - the side porch would be a perfect place for one - and perhaps some lake/sporting equipment. As a family that flies in to vacation in this part of the state, we have stayed at VRBOs that provided these items and appreciate it. While the owners did not provide any, the neighbors were kind enough to share a few floaties, and some friends in the area stepped up with a few other items. Overall a great little spot! Great Place. Cozy, clean, perfect beach and dock set up! Family of 4 + Dog had a great week long stay. Very relaxing location. Had a great stay at this clean and cozy lakefront cabin. Location is about 25min drive from downtown. We enjoyed the expansive views from the sandy beach and dock. Owners and neighbors were friendly and accommodating. Great spot for exploring all that the CdA area has to offer: Mineral Ridge for hiking, Centennial Trail for biking, downtown for shopping and restaurants. We had an absolutely amazing time at the lake house. My wife and I travel often and we were really blown away with the quality of service and the quality of the lake house. The owners went above and beyond to make sure we had everything we needed....I was even amazed when we asked to use the grills one night and they gave us grill tools! All of the kitchen tools were basically brand new....along with everything else in the house! Overall our stay was beyond our expectations and we cant wait to come back again for a nice and relaxing vacation! What a comfortable, clean, homey place to get away. The beach is right out the door. The neighbors are extremely friendly, along with the owners. It had everything we needed to enjoy our week on the lake. The dock was a great place to enjoy the sun and water. Campfires at night brought a great way to end the day. What a super place to get away !!! !